Happy Super Bowl Weekend! Whether or not you are a football fan, there is a lot to do this weekend. So, grab a friend or two and check out these events. The Ackland Art Museum presents: More Love: Art, Politics, and Sharing since the 1990s. The exhibit includes nearly 50 works of art that actively engage with love and the many ways it can be expressed through beauty, emotion, humor, texts, elaborate craft, sound environments, and interactive projects. For each of the artists in the exhibition, love is a significant tool or strategy that constitutes a creative practice built on generosity, inclusiveness, sharing, and questioning. These artists invite, enact, and reflect on multiple modes of expression, among them through touch, gifts, acts of service, and language. Ackland Art Museum,101 South Columbia St. Learn about local organizations to find resources and potential volunteer opportunities to become involved in while visiting the Triangle Resource Fair. There will be free food and door prizes. Running concurrently with the Fair will be the Safe Zone Ally Reception, during which time you can honor the commitments and efforts of Allies at this festive gathering. Bring your favorite Ally or come and show your support to students, staff and faculty of all sexual orientations, gender identities, and gender expressions. Check out the the largest comedy festival in the Southern United States, produced by the DSI Comedy Theater in Carrboro, NC. Stand-up comedians will be performing at various times throughout the festival. Both DSI Comedy Theatre and Local 506 will be hosting performances. Cost for each show varies, Max of $14 per ticket. 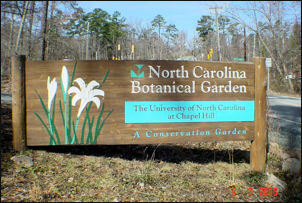 The Garden is beautiful in the winter, but too often people begin looking for indoor activities during the months of November through February. Join us for this guided walk through the Garden, where you will get to experience the beauty of native plants in winter and pick up a few tips to add interest to your home landscape during this time of year. Cost: FREE, but advance registration is required. Learn the industry practice of cupping coffee to determine the attributes of what makes the world’s best coffees. The Baltimore Ravens take on the San Francisco 49ers. Beyonce sings at half time. Have other fun plans for the weekend? Let us know in the comment section below! Previous Article Here’s to a Healthy Heart!